Yes, this is how my friends & I roll into a race. No, this isn't the Bay to Breakers. For the 4th year, I competed in the Wharf to Wharf in Santa Cruz. 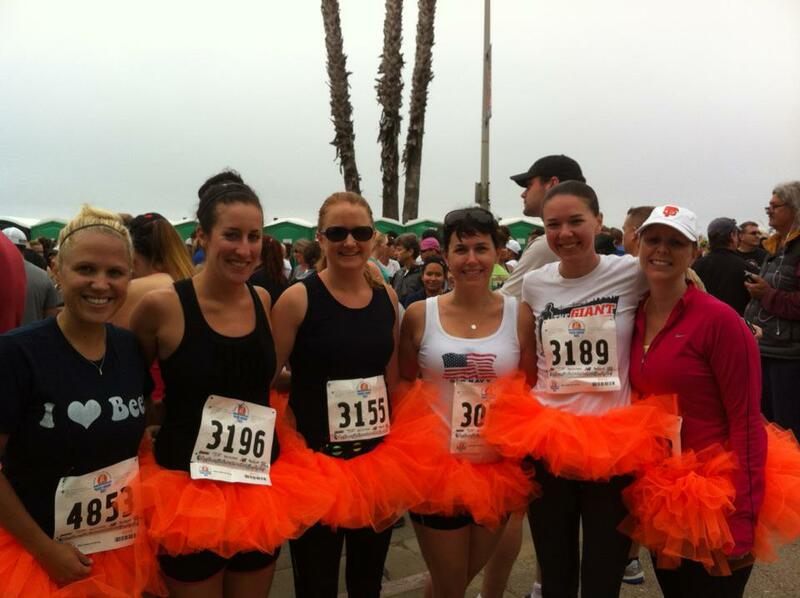 This 10k is billed as the "best little road race in California," and I have to agree. I have more fun doing this race than most. This year (and last year, too), my friend A & I had a goal of finishing in under an hour. I thought I had PRed (for that course), but I was mistaken...The past three years, we'd gone in the 1.02 range, which...isn't bad, but we both felt we could do better. We had both achieved that time in other races, but W2W is a little tougher -- it's super crowded, and the first mile is clogged with people walking (seriously, people, start further back and MOVE ASIDE), so it's hard to get ahead. The gun went off and after about 6-7 minutes later, we were crossing the starting line. A & I were both determined to get past the walkers, so, like college kids at a frat party heading to the keg, we wove through the walkers, busting up their four-across lines and doing our best not to trip over them. After tackling the first few hills, we hit a good groove, rounding out past mile two and waving to my old coworker, Pollywog. I felt we were going at a good clip, and my spankin' new GPS watch (read: impulse purchase) confirmed this was the case. Our times steadily went down -- first mile was in the 10 minute + range, then 9.30, then lower and lower. I couldn't believe it! As we hit the last mile marker, we were almost at a flat 9 minute pace, and definitely going to finish under an hour....the question became how much under? I cut almost 4.5 minutes off my time from the past years. That is huge for me! I had done one quicker before, right over 56 minutes, but that course was way flatter and I am not 100% convinced it was a full 10k. I couldn't have been prouder -- I love having a goal and crushing it. So what's next? 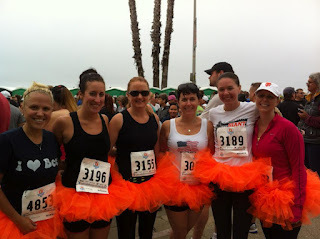 I have the Giants 10k coming up...so maybe we'll see about finishing that in the 56 range (though not in a orange tutu...I have a different one for that! ).